We give the solutions to water pollution -- solutions that are practical and affordable. Go read our article on the causes of water pollution—and don't do those things! But, of course, that would not have been very helpful, and we are all about helping (and often, second helpings). Our next series, Ocean Pollution, will appear on Grinning Planet beginning in 2009. Sign up for our mailing list so don't miss it! In the United States and other developed nations, there are strong laws to protect clean water. Unfortunately, good starts are not always accompanied by strong follow-though. For instance, implementation of the US Clean Water Act in the 1970s did improve water quality over the subsequent decade or two. But the act called for "zero discharge of pollutants into navigable waters by 1985, and fishable and swimmable waters by 1983." Yet almost all surface waters in the US still suffer some level of pollution; discharges are still permitted; the EPA still categorizes roughly 40% of lakes, rivers, and streams as unsafe for fishing or swimming; and the number of US river miles on which people have been advised to restrict their consumption of fish has risen sharply since the early 1990s. Our first water pollution solution is simple: Enforce existing laws. A politician pontificating about a great new anti-pollution law they've sponsored means little if they continue to allow existing laws to go unenforced. Beyond laws, there are some practical water pollution solutions that can be implemented by society and by you as an individual. Right-sizing applications of fertilizer and using techniques like biodynamic farming, no-till planting, settling ponds, and riparian buffer zones can help keep polluted runoff from entering streams. Animal agriculture can be a problem too. For example, runoff from chicken-raising operations is a leading cause of nutrient pollution in the Chesapeake Bay. As a compassionate society, we should probably ban altogether the barbaric practices imposed on animals in concentrated feeding operations; but until we do that, these potent pollution centers must be made to meet strict water quality standards. If you put "normal" fertilizer, pesticides, and other chemicals on your lawn, landscaping, and gardens, you are part of the water pollution problem. While you may find these products helpful, much of their volume is washed by rain or blown by air to nearby streams, ponds, and rivers. They also tend to degrade your soil over time, making your future gardening efforts that much more difficult and reliant on chemicals. You can find out how to have a nice lawn, stop wasting money on lawn chemicals, and stop polluting our waterways by checking out these two articles: lawn care tips and organic lawn care. Prevent further destruction wetlands, and reestablish them wherever possible.. Both inland and coastal wetlands act to buffer surges in runoff and to filter pollutants from runoff and flows. Yet it has been standard practice in the US (and many other countries) to allow development concerns to almost always trump the value of "nature's services." It's time to get serious about preserving wetlands. Nitrogen deposition from air pollution is a big part of the nutrient pollution problem. About a third of the nitrogen pollution in the Chesapeake Bay is from nitrogen deposition from air pollution, much of which comes from automobile emissions. How much we drive, how large a vehicle we motor in, mileage standards, and many other factors all play a part in how much pollution we personally leave behind when driving. People are also constrained with brainless building codes that force separation between houses, stores, and work, forcing us to drive more than we'd like. But driving less is something we all can do better at, if we try; and all of the relatively small individual contributions will make a big difference when summed across millions of drivers. This is a big enough topic that we gave it its own section ... next. If the toilet in your house were spewing its contents onto your bathroom floor, you would make it a very high priority to get the situation corrected. As societies, we should place the same priority on upgrading out-of-date or under-capacity sewage treatment plants that sometimes spew their contents into our waterways. It's also important to ensure that homeowners with septic fields are installing and maintaining their systems in a way that does not contaminate nearby groundwater or surface water. Get going on fixing outdated municipal water treatment plants. If you flush, you may be part of the problem. Society needs to ante up whatever is necessary to fix inadequate sewage treatment systems. But the ante here is not necessarily that painful—for instance, Maryland instituted a mere $3 "flush tax" on citizens' sewer bills to help fund the upgrade of the state's aging treatment plants. Fully fund the Clean Water State Revolving Fund, which provides federal funding in the form of loans to municipalities who need to upgrade their systems. It's worth noting that in 2006 a certain someone with the initials "GWB" decided to significantly cut funding for the program. Boo hiss. Help localities set up programs that ensure septic system maintenance and monitoring. A lot of rural homeowners seem to think that a septic system is a magical place where No. 1's and 2's go, never to be heard from again. Nope. Septic systems are bio-mechanical devices that need occasional attention; otherwise, they begin to fail and send poo-goo into streams and groundwater. A great way to help keep your septic field in good shape is to occasionally add Flow, a biologically active formula that helps break things down. Eliminate "straight pipes." In some areas, even in the US, a few people still run the outflow pipe from their house's plumping system straight to the nearest creek. These illegal setups need to be corrected. Conserve water which helps reduce loads on septic systems and treatment plants, reducing the likelihood that they will send waste into our waters. Water pollution control is most appropriately addressed at the watershed level. As the saying goes, everyone lives upstream of somewhere else. What happens in someone's back yard and neighborhood impacts every other part of the watershed system at lower elevations—all the way to the ocean. constructing wetlands, stream buffer zones, and settlement ponds to allow contaminated runoff to undergo natural biological remediation before it gets into the watershed. You can help by participating in a watershed protection group to help define what's going on in the waterways in your area. A healthy forest acts like a sponge to soak up the rains when they come, holding the water and filtering it before it makes its way to nearby streams, lakes, and rivers. When all the trees are cut down—clearcutting is still logging companies' preferred method of operation—the forest ecosystem dies and can no longer perform this service. Rain water rushes directly into streams, flowing over exposed soil, picking up and carrying sediment pollution into nearby waterways. You can support healthy forests by (a) supporting efforts to ban clearcutting; (b) supporting "roadless rules" that keep logging roads out of pristine national forests; (c) making smarter lumber and paper choices for yourself and implementing methods to save paper. It's also worth noting that paper manufacturing is a highly polluting affair, and using paper sourced with high levels of "post consumer content" helps reduce pollution from the production of virgin paper. Natural shorelines (and the wetlands usually found there) serve many purposes, from fish nurseries to absorption of hurricane impact to filtration of the river water entering the estuary. But in the US alone, more than 20,000 acres of these sensitive areas disappear each year. When houses, hotels, and resorts go up or other development occurs, not only are the wetland and coastal eco-services lost, but the human activity imparts many types of pollution to these sensitive coastal areas. Coastal development is a significant problem for the oceans, but all forms of suburban sprawl chew up wetlands, forests, meadows, and other natural areas that help soak up rains and filter water before it enters streams and rivers. Supporting smart growth, urban redevelopment, and open space preservation is an important solution to water pollution. While it's true that a large amount of oil naturally seeps into the ocean from underground geological sources, marine life in the areas where this occurs have had eons to adapt to the conditions. Human-caused petroleum pollution invariably happens in much more sensitive areas, often with disastrous consequences. The first-level solution to this type of water pollution is to stop letting so much oil and oil byproducts get into the water in the first place. Yes, we must reduce the occurrences of oil spills; but more importantly, we must reduce the amount of petroleum pollution getting into waterways from non-spill sources, which contribute far more to the problem than spills. Quickening the pace of moving the world's tanker fleet to all double-hull ships. Requiring filtration ponds and natural buffer zones around roads and parking lots to help keep runoff contaminated with oil and gas drips from getting into waterways. Doing more citizen education on the subject of how to keep oil out of our environment. Drive your vehicle less. That will mean your vehicle is putting less petroleum pollution into our waters (not to mention less air pollution into our air). Maintain your vehicle more. If you see oil stains on your driveway, your car needs attention. If you must own a motorized boat or jet ski, keep it well maintained. We hope it goes without saying, but if you change your oil yourself, don't dump the used oil down the nearest sewer drain! In many places, local service stations are required by law to accept your used oil. Alternatively, most municipal recycling centers accept used motor oil. It's a real shame that we have let global mercury pollution get so bad that wonderful fish like albacore tuna and swordfish are polluted to the point where they aren't safe to eat, at least not in any significant quantities. The solution to mercury pollution in our waters is to solve the mercury pollution problem coming from the land. In the United States and many other countries, coal-burning power plants are the largest human-caused source of mercury emissions. US power plants account for over 40% of US mercury emissions. Other noteworthy sources of mercury pollution are chlorine production facilities and municipal and hazardous waste incinerators. The technology exists to do a much better job of controlling mercury pollution, and predictive models show that reducing mercury emissions to the air will reduce mercury pollution in water and the subsequent contamination of fish. For existing coal-fired power plants, better scrubber technology can be applied to get 90% of the mercury out of the emissions. For new coal-fired power plants, we should be insisting that the only type of allowed construction is "coal gasification," which allows all of the mercury pollution to be filtered out. Let your state and federal elected officials know that you support such requirements. THE UNITED STATES — A NET EXPORTER OF MERCURY POLLUTION? Defenders of mercury-polluting industries in the US are quick to point out that the US EPA estimates that less than half of all mercury deposition in the United States come from US sources. The implication is that much of our mercury-pollution problem comes from emissions in other countries, and that taking action here can't solve the problem. That defense falls flat, however, when you realize that the EPA also notes that only one quarter of US emissions from coal-burning power plants are deposited in the US—the remainder enters the global air-pollution cycle, adding to mercury pollution in other countries. So, it's important that the mercury pollution problem be solved abroad and here. Another industry defense goes something like this: "Mercury pollution from volcanoes and other natural sources makes industrial sources insignificant." Well, not according to the US Geological Survey. They estimate that human activities may have doubled or even tripled the natural amount of mercury in the atmosphere over the past 150 years. Here in Grinning Planet's coal-rich home state of Kentucky, some streams are so polluted from acid mine drainage that workers who wade into streams to take water samples must wear protective boots and gloves, otherwise the polluted water could cause skin blisters and sores. There are worse cases of pollution from mining—some bodies of water near mining operations are completely devoid of life. In addition to increased acidity, the water can become contaminated with heavy metals like cadmium, which are leached into waterways by the action of rainwater on exposed rock and earth. In gold mining, arsenic leach heaps may leak arsenic into groundwater or surface water. Coal, metals, and other products produced by mining are part of what built modern society. But techniques exist for doing these operations more cleanly, and we owe it to our waters and ourselves to insist on it. Insist that regulatory agencies force industry to clean up long-abandoned but still-polluting mines. Tell our elected officials to prevent the siting of new mines where they are likely to cause water pollution problems. Demand that the mining industry stop the highly destructive coal mining practice of mountaintop removal mining, which often buries streams altogether. Finally, you can place your vote against dirty gold-mining practices at the web site of the No Dirty Gold campaign, which lobbies for reform and helps steer consumers to gold jewelry not produced with the typical high-pollution methods. Biologist Joseph Sheldon has described the chemical inundation of our biosphere as "global toxification". Chemicals are everywhere, in everything—"better living through chemistry" has turned out to have a serious pollution downside. Here's what we can do about it. Get more audio clips on pollution, environmental issues, and many more topics in Grinning Planet's biweekly downloadable audio news feed. Reinvigorate progress on cleaning up superfund sites, and reestablish the "polluter pays" principle. Taxpayers should not foot the bill for decades of industry abuses. Clean up polluted brownfield sites—sites not quite bad enough to make the superfund list, but still pretty bad—and promote their redevelopment. Eliminate all remaining industrial waste-water discharges to streams, enforcing a "zero emissions" policy for the waste water from our factories. Sign into US law the international treaty on persistent organic pollutants. Adopt the precautionary principle: Synthetic chemicals should be considered toxic unless it can be proved otherwise. This concept has already been incorporated into Europe's new "REACH" law on chemicals. As it stands now, the US public is a collective guinea pig for studying the long-term effects of chemicals that have not been proven safe. Upgrade water treatment plants so they can filter out chemicals and pharmaceuticals. Most plants do not handle either. Continue the fight to stop emissions of acid-rain chemicals (sulfur and nitrogen) that not only damage forests but also acidify lakes. Start buying "green" household cleaners and personal care products. (Hint: Most of what you find at Wal-Mart or a "normal" grocery store or drug store is NOT on the "OK" list.) Check out CHEC's Health-E House for tips on how. Only use pharmaceuticals when absolutely necessary. Learn about natural cures and how important good nutrition, sleep, and low stress levels are to keeping you healthy—and pharma-free. Stop all use of chemical pesticides around your house and yard. If you have to dispose of old paint, varnish, or other DIY chemicals, check with your local government's environment or public works office to find out the safest way to do so. Ocean Acidification — As atmospheric CO2 levels have risen, ocean CO2 levels have risen even more, thus increasing the acidity level of the ocean. At a minimum, this trend will negatively affect organisms with shells, which may dissolve or become malformed if the pH drops low enough. Ocean Temperature — As the planet warms, so does the ocean. All organisms in nature have limits to the temperature range in which they can exist. Increasing the temperature of the oceans will have varying—but likely negative—effects on ocean creatures. There are plenty more ways in which global warming will impact water; for instance, less mountain snow pack and smaller glaciers will result in lower river flows for many regions during summer, and melting ice sheets in Greenland and Antarctica will change salinity levels and ocean flows, and will raise ocean levels, inundating coastal properties and ecosystems. But since we're focusing on water pollution solutions in this article, we will leave such effects for another time. In the meantime, when the two water-pollution impacts above are added to the many other predicted general effects of global warming, there's plenty of reason to recommend action on global warming as part of a broad strategy to address water pollution. Good news!—we have an entire article on global warming solutions. Here are a few random water pollution solutions to round out the bunch. Set Cruise Control — All countries should pass laws to prevent cruise ships from dumping untreated sewage, graywater, and oily bilge water into oceans and coastal waters. Globally, coast guards should coordinate enforcement efforts. Do Some Tax Shifting — If we reduce personal and corporate income taxes and increase taxes on chemicals, petroleum products, packaging, and other sources of water pollution, we'll get less pollution—with the market, not regulation, driving the change. Tilt at Windmills — Traditional power plants use fresh water and can add thermal and other types of pollution to that water. Moving much more aggressively on increasing our use of solar energy, wind power, wave/tide energy, and other clean technologies that don't use freshwater resources is a good solution generally, not just for water pollution. If you agree, tell your elected knuckleheads! And check out our article on home solar energy. Fence Me In — Construction sites expose dirt. 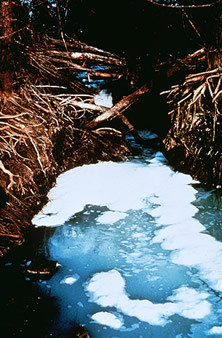 Rain carries the dirt into streams, causing sediment pollution. Better enforcement is needed to ensure that builders use proper mitigation actions, such as mud fencing and regular near-site road cleaning. Give Your Purchases Plastic Surgery — The growing impact of plastic pollution in the oceans will be one of the big disaster stories of this century. Much of the plastic in the oceans comes from ships and boats, but some comes from land-based use. Try to figure out ways you can use less plastic, especially plastic food storage bags and other types of plastic that are easily blown around. Don't litter — Litter from land is carried by wind or rivers to oceans and beaches. So, don't litter. It's also good if you can occasionally pick up someone else's litter. Every litter bit help. (Sorry.) Anyway... A healthy sea turtle somewhere thanks you. Also consider taking part in the annual International Coastal Cleanup. According to the US National Research Council, initial cleanup of contaminated groundwater at some 300,000 sites in the United States could cost $1 trillion over 30 years. That works out to about 33 cents per person per day. Not a trivial amount over time, but not extraordinarily unaffordable, either, considering the importance of having clean groundwater. Back on the surface, the EPA estimates that cutting agricultural pollution could eliminate the need for at least $15 billion worth of additional advanced water treatment facilities. So, some solutions actually cost LESS money. Water utilities in Germany now pay farmers to switch to organic operations because it costs less than removing farm chemicals from water supplies. In a similar vein, industrial companies can increase the trend towards "industrial symbiosis" parks, in which the unusable wastes from one company's industrial process become the inputs for another's, thus keeping solid waste of out landfills, keeping effluent out of waterways, and keeping more profit in company pockets. Manufacturing techniques based on "green chemistry"—for instance, switching to water-based solvents derived from biochemical sources such as citrus fruits, corn, soybeans, and lactic acid—can eliminate the toxic components of an operation altogether. Today's society as a whole has reached unparalleled levels of prosperity. Water pollution solutions ARE affordable and practical—and essential to our future well being. Let's get on with it! We hope you have found our water pollution series enlightening, if a bit exhausting! And now, back to our big mug of hot water contaminated with intoxicating organic coffee. P.S. This series has been so popular that we are developing a follow-on series on Ocean Pollution for 2009. Why not sign up now for our free twice-monthly emails so you don't miss it? Know someone who might like this about Solutions for Water Pollution? Please forward it to them. Our next series, Ocean Pollution, will appear in future issues of Grinning Planet. Sign up for our mailing list so don't miss it!